For me there is some difficulty when it comes to face to face relationships since my accident over a year ago. It might be the memory issues. Perhaps the fear of people. Somewhere along the way . . . hmm, maybe it’s all of it together. As a father I have to get over it at times. I guess when I am able to get into those moments of discussion and encouragement and help my son grow, he knows it’s the real thing. And there I believe lies true nurturing. Humans are very perceptive when it comes to fakes or genuines. Yes, another of my made up words. Perhaps I will create a comic book called The Genuines and the enemies will be The Deceptives. My son is very perceptive. He knows when someone truly cares about him when they are discussing things that are to encourage and help him. He doesn’t need encouragement. I suppose encouragement is great in its place but nurturing is really the thing that is needed. When you nurture you are giving of yourself, your feelings are shared, your time, your blood, your sweat and tears. Even an infant knows the difference between the genuine and the deceptive. My son, aged 10, began his first season of baseball this year. No one believes it. He was apparently born to play the game. Perhaps it was the hours of throwing balls to him over the summer that helped some, the explaining how baseball works, how to properly run the bases, how to relay the ball. It was a sport I could explain and he could learn that carried over. I suppose it helped I took coaching of baseball in college. But what is really helping him are the coaches. He has the best coaches in his league. I don’t say that because they are winning, I say that because their mentality of growing young kids into loving baseball, and training them the right way, and not just about technique. The hitting coach even took time with my son “B” before practice, since it was early, and went through a couple of things with him, and told him he was the most naturally gifted hitter and player he had ever seen. He didn’t have to say that. And his actions back up his words. I take the guys words as truth because of his background. He played college ball, football and baseball at the same University I went to, but ended up with baseball after the first season and was even scouted by the pros. He still plays in leagues that we have here that aren’t for pros. Oh, did I mention his father was a two time football Super Bowl Champion? Encouragement without sincerity is just smoke. It’s a commercial for a toy that kids know won’t work. My son even explains to me why the toys won’t work when he sees the ads. 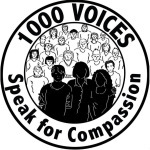 Again, I wasn’t going to do a post today, but it’s #1000Speak for Compassion with the topic of Nurturing. I opened the page and this happened without a thought. Nurturing can be from adult to adult as well. I have people, person, something like that, not only encouraging my writing but taking steps to nurture along the way to lead in the direction of improvement. Not so much teaching me technique but being honest with me. Nurturing is not simply being a cheerleader, nurturing is sometimes be the tough guy for the better. The other person won’t always like it, but through a history with you, they know it is for the better and will go with it. No matter what you do, with whomever you do it with, nurture. It reminds me of one of my favorite verses. If those who follow these words only fulfilled these words, would it not be a wonderful world? I try. I fail at times, I am sure, but I try. Hmm, encouragement with actual interest in the person. Not telling you what you want to hear but what you may need to hear – aka being honest. I try my best at this as well,but probably fail more often than not. I’m glad that you opened the page and this came out. A natural flow of words. An Honest friend is a true friend and one for whom I have much respect and admiration (since i don’t have many of those) Often the honest genuine encouragement that you have mentioned here, has compelled me into re-thinking and bettering myself. Fantastic understanding of real interactions that foster nurturing! Thanks so much for taking the time to write! Some kids can easily spot insincerity and I’m glad your son does that from an early age! And, best of luck to him! I’m sure he’ll make a name for himself as a baseball player in the future!